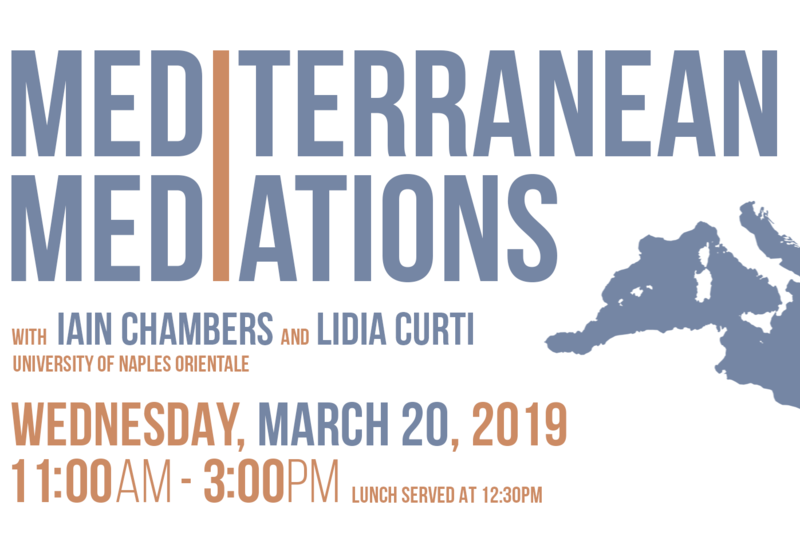 Please join the Franklin Humanities Institute for two talks by Iain Chambers and Lidia Curti of the University of Naples L'Orientale. Iain Chambers, "Mediterranean blues: thinking with the diver"
In this talk, organised around the famous painting of the diver in the Paestum archaeological museum, I propose a cutting up of time and the reassembling of its elements in the urgency of a contemporary constellation. This permits the tearing and perforation of the maps authorised by accredited disciplines and their framing and explanation: from geography and anthropology to history and sociology. Here the prospects of other languages, both musical and visual, enforce the critical imperative of the anachronism that subtracts the Mediterranean from a reductive objectivity in order to think with the unfolding possibilities of an altogether more fluid archive. Lidia Curti,"Diasporic female narratives: crossing the Mediterranean, rewriting Italy"
Through listening to the literary and artistic narratives arriving from the southern shores of the Mediterranean, this paper considers the return of European colonialism, particularly Italian, in the ongoing cultural (and political) constitution of the present. Here a singular understanding of European modernity falls away in the multiple complexity sustained by female bodies in their movement through language, senses and belonging, and their insistence to exist.